The protest against meat eating may turn out to be one of the most significant movements of our age. In terms of our relations with animals, it is difficult to think of a more urgent moral problem than the fate of billions of animals killed every year for human consumption. This book argues that vegetarians and vegans are not only protestors, but also moral pioneers. It provides 25 chapters which stimulate further thought, exchange, and reflection on the morality of eating meat. A rich array of philosophical, religious, historical, cultural, and practical approaches challenge our assumptions about animals and how we should relate to them. This book provides global perspectives with insights from 11 countries: US, UK, Germany, France, Belgium, Israel, Austria, the Netherlands, Canada, South Africa, and Sweden. Focusing on food consumption practices, it critically foregrounds and unpacks key ethical rationales that underpin vegetarian and vegan lifestyles. It invites us to revisit our relations with animals as food, and as subjects of exploitation, suggesting that there are substantial moral, economic, and environmental reasons for changing our habits. 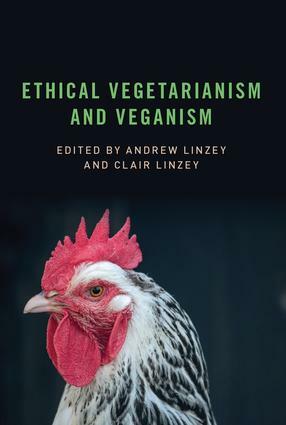 This timely contribution, edited by two of the leading experts within the field, offers a rich array of interdisciplinary insights on what ethical vegetarianism and veganism means. It will be of great interest to those studying and researching in the fields of animal geography and animal-studies, sociology, food studies and consumption, environmental studies, and cultural studies. This book will be of great appeal to animal protectionists, environmentalists, and humanitarians. Andrew Linzey is director of the Oxford Centre for Animal Ethics, and a member of the Faculty of Theology in the University of Oxford. He is a visiting professor of animal theology at the University of Winchester, and the first professor of animal ethics at the Graduate Theological Foundation, Indiana. Clair Linzey is the deputy director of the Oxford Centre for Animal Ethics. She holds an MA in theological studies from the University of St Andrews, and an MTS from Harvard Divinity School. She is currently pursuing a doctorate at the University of St Andrews on animal theology and Leonardo Boff.